Black mushrooms are also called shiitake mushrooms. They have been utilized for their health benefits in traditional Asian healing systems for centuries, and more benefits are becoming apparent as more research is done. You can find black mushrooms sold under other names including forest mushroom, oak mushroom and pasania fungus. Consult your doctor before using black mushrooms medicinally. A 3.5-oz. serving of raw black mushrooms provides you with 3 g of fiber, 7 g of carbohydrates, 35 calories and 2.2 g of complete protein. Black mushrooms contain 18 amino acids, iron, niacin and B vitamins. Niacin helps break down food so the body can assimilate it. It is also critical for nervous system function. Iron helps the body form red blood cells. B vitamins benefit the immune system’s ability to attack toxins, viruses and harmful bacteria, and they also assist the body in metabolizing food. Lentinan, a type of sugar, is the most important therapeutic and beneficial constituent of black mushrooms. A study published in a 2009 issue of “International Immunopharmacology” reports that the lentinan in black mushrooms may prevent malarial infection. In addition, “The Journal of Nutrition” featured a 2011 study that highlighted lentinan as a possible arthritis preventative. Scientists studying lentinan as a treatment for mouth cancer found it effective when used with chemotherapy, as noted in a 2010 issue of the “International Journal of Oncology.” Do not substitute black mushrooms for conventional cancer treatment. A 2010 article in “Archives of Dermatology" reports that if you inhale black mushroom spores in an enclosed environment, they can cause asthma. 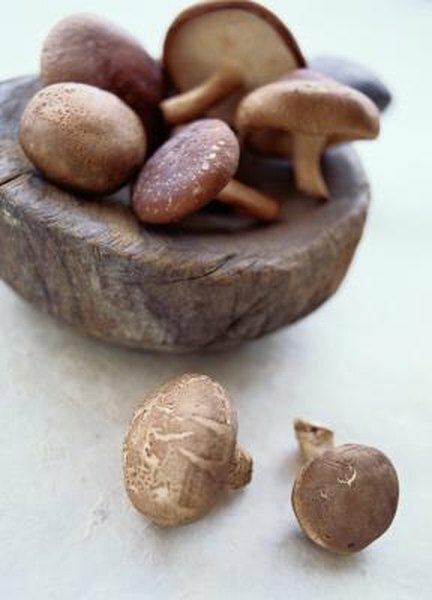 Japanese researchers were the first to describe a skin rash called “shiitake dermatitis” in a scientific journal. If you are sensitive to lentinan, you can develop a skin rash on your torso, arms and legs. This rash usually develops one to two days after ingesting raw or semi-cooked black mushrooms. “Archives of Dermatology”; Flagellate dermatitis. Shiitake Dermatitis (Toxicoderma); C. Girard, et al. ; November 2010.